The nest day started dark and loud today. It was thought by some of the chatters that breakfish was a snake today but the vids were reviewed and a snake on the nest cannot be confirmed due to poor visibility. From dawn to about 10am it actually looked like it was getting darker because of the thunderstorms moving over the area. It was kind of cool to see the nest lit up by the occasional lightning bolt though. Mom and the kids stood in the nest and just waited for the storms to pass. We have a dark blog exclusive video below of the storm on the nest today. It lightened up considerably after the storms passed and Peace and Harmony set about the task of drying off and eating everything delivered to the nest. At one point in the afternoon it seemed like Mom and Dad were delivering a small snack every half hour. At the last snack delivery the kids were laid out for a nap and reacted very slowly to the fact that there was more food available. Peace finally scored the grab and mantle and had her way with the food first. Harmony stole it after a bit and ran around the nest with it to celebrate. Dinner was a large tasty fishy (still flapping) and Mom served them both with a hearty meal. As the shadows grew longer it was a very pleasant evening on the nest and darkness fell on two contented eaglets. Onto the vids and pics of the day. Peace scores first with a snack but Harmony gets the steal. Early morning thunderbumper at the nest. Watch for the lightning to light up the nest. 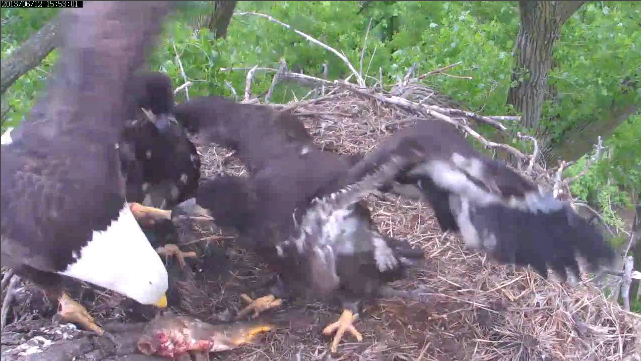 Harmony plays beak nibble with mom as the storm lets up. A blog exclusive vid! And some great pics from today. Hey! That's not the food! So which end does Mom start on again?? Can you call maintenance and get the lights back to where they should be?? Don't ever take food from strangers again!!! This rugby stuff is fun!! Well, Humpday Wednesday started out kind of miserable but turned out OK at the end. Hope your day went even better. A crash of the thunder to Razzle and BBC for the great pics and vids today! Thanks! See you here at the MN Bound nest tomorrow!